"Failure lasts forever but pain is temporary", those the words from the race organizer just before the ride started. 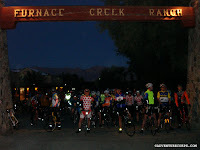 Furnace Creek Ranch was the starting point of the race, the route then continues south on Highway 190 up and out of Death Valley until you reach Shoshone, which is the first turnaround point at 75 miles, at 150 miles you past the starting point to continue the final 50, an out and back to Stove Pipe Wells. Due the fact you have to pass the starting point at mile 150, it has caused many to finish the race early in past years, hence words of warning when starting. There were 172 riders signed up for the Double Century, the fastest few left just gone 6am with the mass wave starting 10 minutes later. I didn't consider my self to be in the "fast few" category as this was my first double century the goal was simply to complete it, not burn out in the first 100 miles. The first 45 miles were mostly flat with a few small rolling hills, I gradually picked up speed and was at an average 20mph towards the end of it. There were a couple nasty cross winds in places a long this road, at one point pushing me towards the center of the road. I skipped the first rest stop at Badwater (17miles in) and made my first stop at Ashford Mill (45miles in), just a few miles beyond this was where the climbing began. It was around mile 55 I hit the top Jubilee Pass at 1290 feet, it was decent climb I worked hard to keep my heart rate no higher than 160bpm, which made for a speed of 12mph. As small reward for reach the top there was a nice downhill on the other side my first chance to get some real speed on the ride. Next up, more climbing I continued with my pace and past few people on the way, until eventually I hit the peak of Salsberry Pass at 3315 feet, as I got closer to the top the head wind became stronger. Down the other side of Salsberry Pass, was a nice straight downhill although the head wind did slow things down a fair bit, as it flattened out towards the bottom it was difficult to maintain 20mph, but soon enough I reached the rest stop in Shoshone. I took a quick break excited to have hit the first turnaround point in the ride, then it was back the way I came. The climb back up Salsberry Pass was the the last major climb on the ride, I figured it would be a breeze from that point on (I was right sort of). As I hit the top of Salsberry pass again, I hit my max heart for the ride of 187bpm. I flew down Salsberry Pass holding nothing back, it was a straight and simple descent, I reached up to 40mph and slowed down so not to fly off the road at the bends. Just was approaching Jubilee Pass, I hit a pot hole, I was fine but a the yellow sponge thing that sits in the tops of my water bottle flew out. I had some good speed going and nice lead on the a couple of the riders I met at the last stop. So I continued on but the guilt of littering in a National Park quickly set in so a less than half mile later I turned as I headed up the hill again, I saw the other two riders coming towards me, they must of thought I was mad to climbing the hill again. 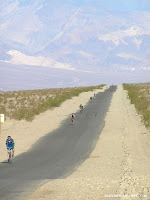 I only lost a couple of minutes there and quickly past the two riders again and headed down into Death Valley. The further down I got the stronger the wind was and it was not going in the right direction :-) I stopped again at the Asford Mill rest stop now at mile 103. This is where things started to change, I had ridden further than I had ever done before, what was going to happen next? 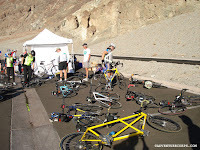 Well the wind made the next 30 miles to the Badwater (lunch stop) incredibly tough, my exertion and speed were not very different to the climb earlier. Having gone it alone for the most part, I decided a bit of team work was in order so I caught with the guy in front and we took turns drafting off each other. I'm not sure if this really helped much, I managed maintain a slightly higher speed than he could, but the company was welcome. It is at times like this when you need someone to share the pain with. The road seemed to go on and on, with no end in site. This felt like the longest 30 miles i had ever ridden, I was starting to feel real pain, never before have I worked out to point where my heart felt sore. This not a good feeling to have especially when your in a place called "Death Valley", you find yourself thinking about death, for some reason? Finally time for lunch! At the 130 mile point it was time for some real food not just "GU" like I'd been eating all morning. I took this rest stop seriously I need my heart to recover before starting out again. I had sandwich, some fruit and some always nutritious Oreo cookies :-) Put on some more sun block, filled up the water bottles then continued on. I started off with the guy I had ridden the past 30 miles with but the next thing I knew he was way behind, it was time again the battle against the wind alone. The 20 miles to Furnace Creek were easier than the previous 30, the wind was dying down and I was able to get my average speed up again. 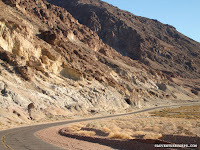 I could see the remainder of the journey right a head of me and seemed very daunting. Before I knew it I was at the 150 mile point and didn't even consider throwing in the towel, I felt ten times better than I did at the previous stop and ready to take on the final 50. 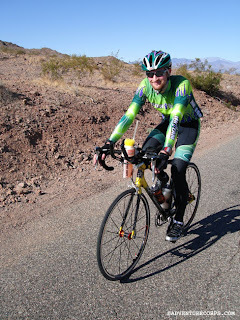 I started out fairly easy on the 25 miles out to Stove Pipe Wells, there was no one insight behind or ahead me. I did start to see the first of the riders head back in the opposite direction. While quite happy at my own pace, from out of no where three riders past me, all drafting from each other. 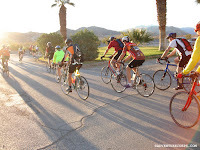 I was starting to feel competitive again, my first thought was just to hang back and pass them towards the end of the ride, but then the front runner of the pack broke away from the other two, so I figured this was my chance. With a sudden burst of speed I past all three while heading up the hill, my heart rate also quickly jumped to 170bpm, I maintained the speed for a few minutes to put some distance between me and them. 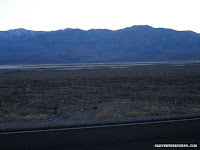 By now it was getting dark, I switched on my front and rear lights and I headed towards Stove Pipe Wells in the distance. I could start to see the a another cyclist ahead of me the other guy was not never far behind. I made it to the last check point and found out I was the 11th rider through, seeing the 10th standing right in front my I quickly left the rest stop and headed back towards the finish 25 miles away. I was a couple minutes ahead of the #10, and did my best to keep an average speed of 20 mph. After about 15 miles the guy finally past me, I managed to keep in my sights for the next few miles with a hope of passing him again, but all of a sudden hunger set in. I quickly had the last bit of nutrition I had on me, but I wasn't going to catch the guy at this point. Exhaustion can set in fast and I was running out of steam, thankfully I was right near the end and finished the ride 13 hours 16 minutes! Never have I gone so far and so long. Rode the one hundred and seventy two. Rode one hundred and seventy two. When can their pain fade? O the wild ride they made! The Crazy one hundred and seventy two.